I did 88 1/2 hours at PBP 2011. It was exactly what I wanted – the maximum experience, stopping for refreshments from the locals and to join the party atmosphere. With my knee injuries I didn’t have the form for a fast ride anyway, but I ended up pleased with my resolution to get stuck in and enjoy myself regardless. I mention this just because I don’t want to seem dissatisfied with the ride or to take anything away from those who choose to ride dans la manière de touristes. But, for my own part I would not go back and do the ride again at the pace I rode this edition. More than anything, it is brutally hard to be on the road for that length of time. Because the effect of being on the road compounds with every successive dawn, it would be considerably easier to ride if you finished more than a day earlier. At times the only thing that kept me going was the surety that the only thing worse than what I was enduring would be to fail to endure it! There are four years and myriad assumptions involved in getting to PBP 2015, but I’d like to think I’ll be back and angling for a much faster ride. With that in mind I’ve done what may seem like an excessive amount of thinking now, mainly to get it in writing before memory fades the lessons I promised my sleep-deprived self that I *would* learn at the time. The results were interesting. Eleven of sixteen people who responded rode within a couple of hours of 50h (moving time), while their finishing times varied from 60h to 90h. 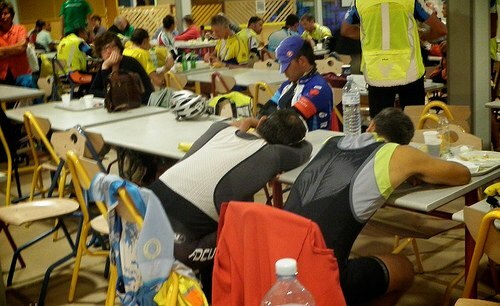 Sleep was rather variable – one rider slept for 12h and finished in 78h, another slept for 4h but finished in 81h. 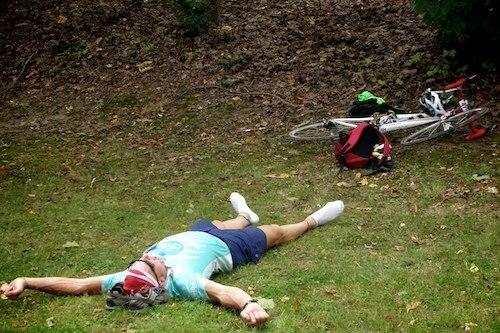 Sleep is a tricky question because while you’re not moving, you are recovering the ability to ride much harder. At all but the very front edge of the ride, it’s far from clear that you lose time when you close your eyes. For example: I got to Carhaix at the same time as an English couple on a tandem. Having started in the same wave, at this point our average speeds were identical. The tandem crew slept early at Carhaix (it was not even 9pm), planning to rise and continue in the early hours. I rode on to Brest to sleep, feeling that I’d rather miss the ‘dead hours’ of early morning..
We met back at Carhaix, so again our speeds were identical – but with a big difference. I had taken 6 hours to get to Brest (of which 30 minutes was spent on a table at Sizun, overcome by exhaustion), spent barely three hours asleep, then ridden back. They had slept for much longer and powered through the night with fresh minds and legs. Time spent at controls *not sleeping* was a closer match to finishing time – three of the four riders who came in under 70 hours spent ~7 hours faffing around. Riders finishing 70-80h spent around 16h off the bike, while riders who came in up to 80h spent around 23h. So as you’d expect for a relatively similar ride time, the time you spend awake but not turning those pedals essentially determines your finish time. Obviously this is a terribly small sample, so take it with a pinch of salt. Unfortunately the PBP timing mats only tell you arrival time at each control, so it’s not possible to work out for the entire field the proportion of time spent on and off the bike – many will have ridden round in 90 hours without enough time in hand to stop and sleep, while some may have spent as little as 40 hours on the bike but indulged themselves in a lot of R&R! However, the bottom line for a nippy PBP is that the first priority must be to keep moving, or at least doing things that will benefit your average speed (i.e. sleep!) rather than focusing on your speed on the bike. 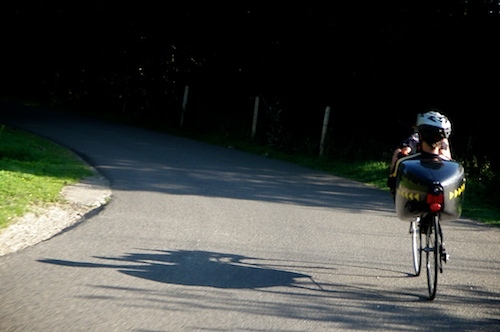 Chasing Andreas Koerner, who took 4 hours from the recumbent course record. I have been looking at GPX traces generously provided by other riders and the second lesson seems to be that you can slash a large fraction of your time with a relatively modest increase in average speed. If you look at the ride from a robot’s perspective, 765 miles ridden at 12mph is almost 64h, while a modest increase to 14mph yields 54.5h, almost a ten hour saving. For the faster riders, 15mph gives you 51h, but 17mph brings it in at 45h. A one-sleep strategy of 3 hours (Carhaix on the return seems popular) leaves 12 hours for time off the bike at controles to bring in a sub-60 hour ride. With a sub-60 hour (not really a 53h!) ride in mind, I grabbed the GPS trace of a much faster rider and carefully trimmed his ride, and mine, around the control stops, before looking at the amount of time spent at any given speed. The bike I rode on PBP this year weighed in at 22.5kg complete with luggage (not including water). I myself was pretty porky at ~80kg (having a chronic knee injury through the summer added about 8kg over my weight at the turn of the year). That’s a total of around 105kg that I was having to haul uphill. Getting a bag drop, either at Loudeac or ideally Fougeres / Carhaix would make it significantly easier to drop things from the bike (I’ve now done the fully self-supported ride, thanks!) and add the option of stashing things like carbohydrate drink mix and solid rations which would permit the bounce through many controls, and probably be more digestible anyway. A 70kg rider on a 10kg bike, by contrast, would climb 25% faster (for the same power output). I spent 11 hours riding at < 10mph, which means climbing since even at the finish I was going well over 15mph on the flat. That weight change alone would cut two and a half hours off my riding time, bringing me in at 48.5 hours even if I rode again with shattered knees. So, bring on PBP 2015! 60 hours may be a big ask for what is basically a non-drafting ride (ah, for a peleton of recumbents!) – but if your challenge isn’t challenging… what’s the point? The cruelest irony of cycling is that slower riders spend more time in the harshest conditions. +1 to to your concept. The 12 hours awake before the start caught up to me enroute to Brest. A few hours of rest between 1200 and 1730 on the start day might have allowed me to arrive Brest fresher get a few hours of good sleep and charge on. Instead I went brain dead and rode slugish until I got a good sleep in tinteniac. I need a way to sleep up to the starting time. Dammit Dave, you make it sound easy when you put it like that! In fact, you’re almost tempting me to do it again, even though I’ve already thought up other cycling plans for 2015 in order to keep me away from Paris. I think the gloss has worn off a little over the last 18 months too… but who knows? A sub 70 time would be good I think and should be do-able, since I spent so long at controls not sleeping. I mean, IIRC I got to Dreux at ~10pm and finished the ride about 12 hours later – an average that is slower than walking speed? Preparing for my LEL this summer, I find myself repeatedly coming back to re-read your articles for inspiration and good tips. Must mean they are full of value! Since this will be my first audax I have no experience of how I will hold up with the lack of sleep. I’ve done the same distance before, but over more days with less daily bike time and a full night’s kip each day. So I’m hoping to give myself as much LEL sleep time as possible, which will mean riding a faster pace. So here’s my question to you, as an experienced audaxer: if we assume I am capable of riding for 300km/12+hours at a moving speed of (say) 26km/h, how is that likely to drop over the following 4 days? Will riding at close to my long distance upper limit cause me to fatigue more/quicker than if I backed off to a more comfortable 22km/h say? My query hinges around the balance between the rate of fatigue and the consequent need for sleep/recovery. I agree with your analysis that a faster rider who spends less time on the bike will suffer less (although on a bent, the total body suffering is reduced), but if by riding faster he needs more sleep to recuperate, or – worse still – if the accumulated fatigue exceeds his “limit to continue”, he might do better to take it easier. Of course, we must all differ in how we recover/fatigue from day to day, but I wonder if there’s a rule of thumb here? This is a very individual question and I’m not really able to comment except from my own experience. You don’t say whether your main aim is just to finish, or if you are motivated to complete under a certain time. Assuming the former, I would say that your strategy should be to establish a comfortable time buffer early on (when the ride is, I think, pretty flat) but then not seek to build that up too much by racing unnecessarily until you get towards Scotland and know how your body is feeling. The real danger on such a long ride is that you will irritate something in your knee or ankle that will threaten a DNF. 1400km is such a long distance that even if you spent 400km cruising at a true average of 20kph (no dawdling in controls!) you would end up with 12 hours time cushion after 20 hours riding! Then if you feel like racing, you’ve still got 1000km to let rip, but I think you will have safely burned off any initial excitement without injury and be set for the long haul. If you want to race, I have slightly different advice..